Mulch Outfitters offers several playground surface accessories that can help reduce the maintenance of your surfacing, increase the life and improve the accessibility. With such a large variety of accessories available, we can help you decide on the right accessories for your playground depending on your needs and your budget. 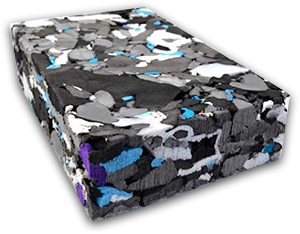 Our impact drainage pads are constructed from cross-linked and closed cell polyethylene foam. Installing impact drainage pads throughout the playground surface can help maintain impact attenuation throughout the playground - especially in areas where playground mulch frequently gets displaced. The pads also drain quickly and efficiently, so playgrounds stay drier, safer, and cleaner. Borders are often installed around the perimeter of a playground to help contain loose-fill surfacing and give the playground a finished, clean look. Borders are available in either plastic or rubber construction, with heights ranging from 4” to 12”. Rubber mats are used to minimize the amount of loose-fill material that is displaced in high traffic areas, such as under swings or at the end of slides. Placing mats on top of the loose-fill playground surfaces in these key areas can greatly reduce your maintenance. Our ADA compliant ramps are designed to work with our borders and can be installed on new or existing playground surfaces to provide easier access for children with disabilities.